#7281 Smooshees Cuddler Companions "Mary & Missy Mare"
Description: Cowgirls who love ponys will love this set with Smooshees Cuddler cowgirl Mary and her Smooshee pet pony Companion Missy Mare. Mary and Missy Mare were sold with a small jeep that Mary can be smooshed into, and a small horse trailor that Missy Mare can be smooshed into. The set also includes a horse blanket that fits over Missy Mare. 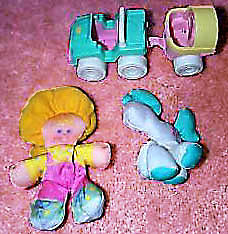 The Smooshees are not marked with a model number, but they were sold with a sewn-on tag marked "Fisher-Price" and the trademark "S" for Smooshees. This set was designed for children ages 4 years and older. FPT14496 - Mary - Female Smooshee with a stuffed cloth body and a printed face and clothes. She has orangish-yellow fabric "hair" with a long "ponytail" in the back. She has printed eyes, a round red nose, pink cheeks, and a red line smiling mouth. She has printed clothes with a yellow shirt with greenish-blue polka-dots under pink overalls. She has greenish-blue shoes with yellow polkadots and dark blue printed shoe laces. FPT16210 - Missy Mare - Small Smooshee pony with a stuffed cloth body and a printed face and clothes. Missy has a white body with pink dots on the side of her head and hips. She has a light green mane and tail and light green pads on the bottom of her feet. She has blue and purple eyes, pink cheecks, and black dot nostrils. FPT16211 - Small yellow fabric pony blanket with stitch on the edges. The pony blanket it really just a rectangular piece of cloth sewn together on one corner. The blanket has a tag sewn on the inside marked "Made in China". Measures 2" long, 1-1/4" wide. FPT16212 - Green jeep with a purple base and interior. The jeep has a white roll bar on the top and a yellow heart on the trunk lid. The jeep rolls on 4 white wheels. FPT16216 - Yellow trailer with a pink base and interior, and a white door with a yellow heart on the back that folds down to make a pony ramp. The front of the trailor has a movable clear plastic shield. The front also has a hinged white hitch to connect to the jeep. Measures 4-1/2" long with hitch out and back door down, 2-1/2" wide, 2-1/2" tall. Mary - Same as described above. Missy Mare - Same as described above. FPT16214 - Small pink fabric pony blanket with stitch on the edges. The pony blanket it really just a rectangular piece of cloth sewn together on one corner. The blanket has a tag sewn on the inside marked "Made in China". FPT16215 - Light green jeep with a pink base and interior. The jeep has a white roll bar on the top and a yellow heart on the front hood lid. The jeep rolls on 4 white wheels with a pink ring around the edge. The jeep has a lift-up trunk lid with a raised molded heart and handle on top. Measures 3-3/8" long, 2-3/8" wide, 2-1/8" tall. FP7281BOX1988 (Box ONLY) - Sold in a 13" long, 12-1/4" high, 3-1/8" deep display box. This set was also sold in #7220 Cuddler Companions Assortment. The only other Smooshees set that used a horse blanket was the #7225 Country Cuddlers set that includes a pony stable, a Smooshee Pony named Peggy, and more!